Brian Sanchez concentrates his practice on civil defense litigation and insurance coverage. He has extensive experience in the defense and trial of complex civil cases involving catastrophic personal injuries, construction law, product liability, and premises liability. 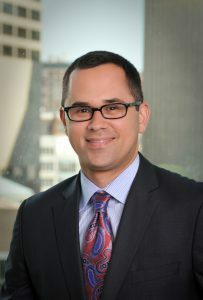 He also has extensive experience representing clients in the analysis, litigation, and settlement of disputed coverage claims involving general liability coverage, commercial property insurance, auto insurance, directors and officers liability coverage, and bad faith. Mr. Sanchez regularly appears in both state and federal courts to advocate on behalf of his clients, and he also has substantial experience in obtaining favorable results through mediation. Central Illinois Compounding, Inc. v. Pharmacists Mutual Ins. Co., 2018 IL App (3d) 170809. Won affirmance of the trial court’s order granting summary judgment in favor of commercial property insurer, finding an exclusion for loss caused by water below the surface of the ground applied and the insurer did not act in bad faith in relying on the exclusion. Barnai v. Wal-Mart Stores, Inc. et al., 2017 IL App (1st) 171940. Won reversal of the trial court’s order finding a settlement between the direct defendants and the plaintiff was in good faith, where the trial court had no information about how the settling defendants allocated fault amongst themselves at the time the good faith finding was entered. Also won reversal of the contribution judgment following jury trial against the employer, on the basis that one of the settling defendants whose contribution claim had been dismissed prior to verdict still had to go on the verdict form for fault to be fairly allocated. Nat’l American Ins. Co. v. Harleysville Lake States Ins. Co., 622 Fed. Appx. 570 (7th Cir. 2015). Won affirmance of the District Court’s decision finding the auto exclusion of the client’s CGL policy excluded coverage for an $800,000 settlement entered into by the insured’s trucking insurer, and the mechanical device exclusion of the trucking insurer’s policy was inapplicable. Powell v. American Service Ins. Co., 2014 IL App (1st) 123643. Won affirmance of the trial court’s decision dismissing plaintiff’s bad faith complaint on the basis that plaintiff failed to allege sufficient facts to show that liability against the insured was reasonably probable at the time the settlement demand was made. Obtained summary judgment on behalf of a CGL carrier, with the court finding no duty to defend or indemnify the named insured in a wrongful death suit based on the Contractors Coverage Limitations Endorsement and the definition of “temporary worker” therein. Negotiated a settlement at mediation in a commercial breach of contract and fraud dispute resulting in over a $1 million settlement in favor of the client. Obtained summary judgment on behalf of a commercial auto insurer regarding the duty to defend a passenger of a taxicab, on the basis that the passenger was not “operating” the cab as defined by the policy.